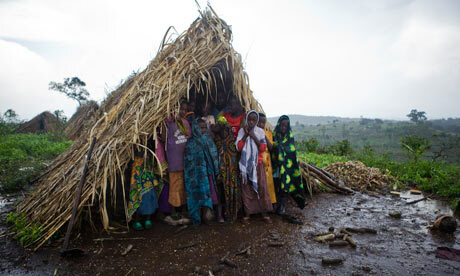 These people living close to Kicucula village claim to have been evicted from forest land in Mubende district, Uganda. Photograph: Simon Rawles/OxfamFrancis Longoli, a small farmer from Kiboga district of central Uganda, is tearful: “I remember my land, three acres of coffee, many trees – mangoes and avocados. I had five acres of bananas, 10 beehives, two beautiful permanent houses. My land gave me everything. People used to call me ‘omataka’ – someone who owns land. Now that is no more. I am one of the poorest now,” he says. Longoli and his family of six lost everything last year when, with three months notice, the Ugandan government evicted him and thousands of others from the Mubende and Kiboga districts to make way for the UK-based New Forests Company to plant trees, to earn carbon credits and ultimately to sell the timber. Today, the village school in Kiboga is a New Forests Company headquarters. More than 20,000 people have been made homeless and Longoli rents a small house in Lubaali village. He says he cannot go back for fear of being attacked. “I no longer own any land. It’s impossible to feed my children – they have suffered so much. Some days all they eat is porridge from maize flour. When people can’t eat well their bodies become weak – there have been lots of cases of malaria and diarrhoea. Some days we don’t eat anything at all,” says Longoli. Land tenure in Uganda is frequently disputed, with the government handing out parcels and then trying to take it back. In this case, the land was originally a government forest reserve and some of the people evicted claim they were given deeds by the Idi Amin government because their families fought for Britain in the second world war. Others say they had bought the land legally. Their land claims were being considered by the Ugandan courts when, they allege, the army and police forced them out in several waves of violent evictions which took place up to last year. They add that the company played no part in the evictions themselves. “The land clearances were voluntary and … the company played no role in them”. Today, the people evicted from the land are desperate, living with relatives or having moved away from the area. They say they were not properly consulted, have been offered no adequate compensation, and have received no alternative land. An Oxfam spokesman says: “They had schools, health centres, churches, permanent homes, and farms on which they grew crops to feed themselves and surpluses to sell at market. They paid taxes. Theirs were strong and thriving permanent communities. “Land grabs are going under the radars of existing safeguards intended to protect vulnerable people. The New Forests Company describes itself as ethical and says it follows international standards, yet more than 20,000 people were evicted without meaningful consultation or compensation to make way for their plantations,” says Oxfam director Barbara Stocking. “It’s not acceptable for companies to blame governments for shortfalls in their operations. Investors, no matter how noble they purport to be, cannot sweep aside the needs and rights of poor communities who depend on the land they profit from,” she says. NFC responded with a statement saying it is taking Oxfam’s allegations “extremely seriously” and is conducting an “immediate and thorough” investigation. “Our understanding of these resettlements is that they were legal, voluntary and peaceful and our first-hand observations of them confirmed this,” says the statement. So this is how the UK lets their corporations help to cause starvation in Africa. They should be cutting pollution not stealing land and planting trees in another country. 20,000 more hungry Africans thanks UK greedy, profiteering, inhuman, thieves. Stay in your own country. Stop stealing land in other countries.